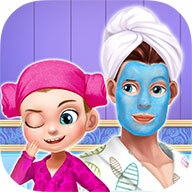 Bravo Kids provides fun and educational games for little girls. In our games, you can experience all kinds of roles as little professionals, and use your talent to help people! Find us on Apple's iOS and Google's Andriod operation system! Want to prank your daddy with a beauty spa? He'll probably agree because it's your annual play day! Daddy will be doing spa, makeup, manicure and a lot more! Anything you can ever imagine! A woman's good health is essential to the good health of her baby, we'll walk you through all the steps to give your developing baby the healthiest possible start in life. These patients need YOUR help! Use medical tools to clean wounds, cut skin open, repair organs and sew the skin back up! Save the lives of your patients and wonder at just how amazing the human body is! Bravo Kids Media © 2017. All Rights Reserved.